View our modern engagement rings here. If you're in the market for an engagement ring, you're in luck. There's never been a better time to buy. But today's engagement rings aren't necessarily the kind your Mom and Grandma wore; while classic diamond-studded bands remain timeless and easy to find, there's much more to the modern engagement ring market. In fact, if you haven't priced jewelry lately, you might be surprised at what you find. Classic engagement rings are always in style and, while they don't necessarily classify as a trend, there are certain recent preferences that may be observed. Diamond solitaires with or without matching baguette-cut stones are always popular, with oval-cut stones currently dominating the market, though round and emerald-cut diamonds are still favored. Gold is as hot as ever, but platinum has become the favored metal for the engagement rings themselves. 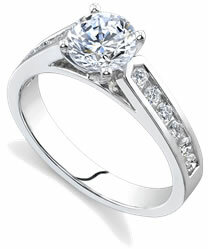 Platinum's silvery luster helps bring out the fire and sparkle of the diamonds, and unlike silver will never tarnish. Further, it's strong and hard, so it's difficult to ding or dint; and it's the heaviest metal used for engagement rings, weighing in at twice the weight of the same amount of 14-carat gold. It'll give your engagement ring that little extra bit of heft and authority. Elegant filigreed designs and inset stones are also particularly the fashion for today's engagement rings. Paradoxically, yesterday's engagement rings have also come back into style. Antique rings in gold and platinum often display superb stones and intricate metalwork, and are favored because of the modern trend toward wearing vintage clothing. Vintage-inspired modern engagement rings are also seen more often, as are engagement rings bearing colored stones, especially diamonds. These gems are rare and special, especially the blue, red, and pink specimens, and nothing draws attention to an engagement ring like a colored diamond. Celebrities, of course, realized this long before the rest of us, and a good part of the modern trend toward engagement rings with colored stones can be traced back to ladies like Jennifer Lopez, who during her engagement to Ben Affleck flaunted an engagement ring with a six-carat pink diamond. If $1.2 million is beyond your means, there are plenty of other less opulent stones you can choose from; or you can stick with a white or blue-white stone, while accenting it with colored diamonds or other gems. One exciting trend is the increased interest in men's rings. Engagement rings were long considered the exclusive domain of women, but nowadays men are horning in on the act. Of course, men's engagement rings are larger and often more ornate than those meant for women; imagine, if you will, a half-inch platinum band encrusted with diamonds. Other modern engagement rings, for both men and women, offer streamlined designs and innovative new cuts and sets, including the princess cut (a modified square), diamonds with increased numbers of facets, special bezel settings (to protect and better hold the stone), and the tension-setting, which holds the stone at its very edges, so it appears to float above the engagement ring.